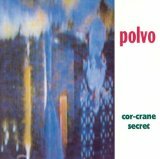 Cor-Crane Secret is ranked 3rd best out of 8 albums by Polvo on BestEverAlbums.com. The best album by Polvo is Today's Active Lifestyles which is ranked number 3051 in the list of all-time albums with a total rank score of 627. Members who like this album also like: The La's by The La's, The Sea And Cake by The Sea And Cake and Pod by The Breeders. Related links: top tracks by Polvotop tracks of the 1990s, top tracks of 1992. Showing latest 5 ratings for this album. | Show all 11 ratings for this album. Related links: top albums of the 1990s, top albums of 1992.